The green anaconda (Eunectes murinus), also known as common anaconda or common water boa, is a non-venomous boa species found in South America. It is the heaviest and one of the longest known extant snake species. The term anaconda often refers to this species, though the term could also apply to other members of the genus Eunectes. The green anaconda's scientific name is derived from the Greek εὐνήκτης, meaning "good swimmer", and the Latin murinus, meaning "of mice", for being thought to prey on mice. "The name first was probably from the Sinhala language of Sri Lanka, formerly Ceylon, and that in 1869, the Englishman John Ray wrote of "anacandaia of the Ceylonese, i.e., he that crushes the limbs of the buffaloes and yoke beasts." For more than one hundred years the name was applied to a (python) snake from Ceylon, but in the nineteenth-century experts began to use it for a snake residing in the Amazon basin. The green anaconda is the world's heaviest and one of the world's longest snakes, reaching 5.21 m (17.1 ft) long. More typical mature specimens reportedly can range up to 5 m (16.4 ft), with the females, at around a mean length of 4.6 m (15.1 ft), being generally much larger in adulthood than the male, which averages around 3 m (9.8 ft). Weights are less well studied, though will reportedly range from 30 to 70 kg (66 to 154 lb) in an average-range adult. It is the largest snake native to the Americas. Although it is slightly shorter than the reticulated python, it is far more robust: the bulk of a 4.5 m green anaconda would be comparable to a 7.4 m reticulated python. Eunectes murinus is probably the heaviest extant species of snake or squamate in the world, perhaps only rivaled by the Komodo dragon. Reports of anacondas 35–40 feet or even longer also exist, but such claims need to be regarded with caution, as no specimens of such lengths have ever been deposited in a museum and hard evidence is lacking. A $50,000 cash reward is offered for anyone who can catch an anaconda 30 ft (9.1 m) or longer, but the prize has not been claimed yet. The longest (and heaviest) verified specimen encountered by Dr. Jesús Antonio Rivas, who had examined thousands of anacondas, was a female measuring 5.21 m (17.1 ft) long and weighing 97.5 kg (215 lb). The color pattern consists of olive green background overlaid with black blotches along the length of the body. The head is narrow compared to the body, usually with distinctive orange-yellow striping on either side. The eyes are set high on the head, allowing the snake to see out of the water while swimming without exposing its body. The remote location of the snake's habitat has historically made locating, capturing, and returning specimens difficult. Transporting very large specimens to museums, especially before substantial decay, is difficult (though this has not prevented the return of much larger and more cumbersome crocodilian specimens). Skins can stretch substantially, increasing the snake's size by more than 50% if stretched during the tanning process. Reports without physical proof are considered dubious if from nonscientists, as such individuals may at worst be more interested in promoting themselves or telling a good tale, or at the least may not be sufficiently trained in proper measurement methods. Observational reports of animals which were not captured are even more dubious, as even trained scientists often substantially overestimate the size of anacondas prior to capture. According to the Guinness Book of World Records, this species has been perhaps subject to the most extreme size exaggerations of any living animal. At the same time, it is difficult to argue a maximum possible or plausible size, because anacondas are known to continue to grow throughout their lives. Older reports, in particular, could include individuals which, in times of less pressure from humans, lived longer lives and thus reached greater sizes. Numerous historical accounts of green anacondas are reported, often of improbable sizes. Several zoologists (notably Henry Walter Bates and Alfred Russel Wallace, among others) note rumors of snakes beyond 30 or 40 feet long, but in each case, their direct observations were limited to snakes of approximately 20 feet in length. Numerous estimates and second-hand accounts abound but are generally considered unreliable. To prove the point of overestimating, in Guyana in 1937, zoologist Alpheus Hyatt Verrill asked the expedition team he was with to estimate the length of a large, curled-up anaconda on a rock. The team's guesses ran from 6.1 to 18.3 m (20.0 to 60.0 ft); when measured, this specimen was found to be 5.9 m (19.4 ft). Almost all specimens in excess of 6 m (19.7 ft), including a much publicized specimen of 11.36 m (37.3 ft) in length, have no voucher specimens, including skins or bones. The skin of one specimen, stretched to 10 m (32.8 ft), has been preserved in the Instituto Butantan in São Paulo and is reported to have come from an anaconda of 7.6 m (24.9 ft) in length. In one of the most reliable accounts, a geologist killed a large anaconda and measured it using a four-meter rod, reporting it as three rods long (12 m (39.4 ft)); however, the information was not published until many years later, and the geologist later suggested he may have misremembered and the anaconda could have been only two rods long (8 m (26.2 ft)). While in Colombia in 1978, herpetologist William W. Lamar had an encounter with a large female specimen which measured 7.5 m (24.6 ft) and was estimated to weigh between 136 and 180 kg (300 and 397 lb). In 1962, W.L. Schurz claimed to have measured a snake in Brazil of 8.46 m (27.8 ft) with a maximum girth of 112 cm (3.67 ft). One female, reportedly measuring 7.9 m (25.9 ft) in length, shot in 1963 in Nariva Swamp, Trinidad, contained a 1.5-m caiman. A specimen of 7.3 m (24.0 ft), reportedly with a weight of 149 kg (328 lb), was caught at the mouth of the Kassikaityu River in Guyana, having been restrained by 13 local men, and was later air-lifted for a zoo collection in the United States, but died in ill health shortly thereafter. The largest size verified for E. murinus in captivity was for a specimen kept in Pittsburgh Zoo and PPG Aquarium, which grew to a length of 6.27 m (20.6 ft) by the time she died on July 20, 1960. When this specimen was 5.94 m (19.5 ft) long, she weighed 91 kg (201 lb). The estimated weight for an anaconda in the range of 8 m (26.2 ft) is at least 200 kg (440 lb). National Geographic has published a weight of up to 227 kg (500 lb) for E. murinus, but this is almost certainly a mere estimation. Weight can vary considerably in large specimens depending on environmental conditions and recent feedings, with Verrill's aforementioned specimen, having been extremely bulky, scaled at 163 kg (359 lb), whereas another specimen considered large at 5.06 m (16.6 ft), weighed only 54 kg (119 lb). Size presents challenges to attain breeding condition in larger female anacondas and while larger sizes provide the benefit of larger number of offspring per clutch, the breeding frequency of the individuals reduces with size, indicating that there is a point at which the advantage of larger clutch size is negated by the female no longer being able to breed, for the anaconda, this limit was estimated at approximately 6.7 m (22.0 ft) in total length. This is consistent with the results of a revision of the size at maturity and maximum size of several snakes from North America, which found that the maximum size is between 1.5 and 2.5 the size at maturity. The minimum size of breeding anacondas in a survey of 780 individuals was 2.1 m (6.9 ft) in snout-vent length, indicating that maximum size attained by anacondas following this pattern would be 5.3 m (17.4 ft) in snout-vent length. However, most anacondas are captured from the llanos, which is more accessible to humans and has smaller prey available, while the rainforest, which is much less explored and has more plentiful large prey, may be home to larger snakes. In the famous 10th edition of Systema Naturae of 1758, Carl Linnaeus cited descriptions by Albertus Seba and by Laurens Theodorus Gronovius to erect the distinct species murina of his new genus Boa, which contained eight other species, including Boa constrictor. The generic name Boa came from an ancient Latin word for a type of large snake. The first specimens of Boa murina were of immature individuals from 2.5 to 3.0 feet (75 to 90 cm) in length. In 1830, Johann Georg Wagler erected the separate genus Eunectes ("good swimmer" in Greek) for Linnaeus’s Boa murina after more and larger specimens were known and described. Because of the masculine gender of Eunectes, the feminine Latin specific name murina was changed to murinus. Linnaeus almost certainly chose the scientific name Boa murina based on the original Latin description given by A. Seba in 1735: "Serpens testudinacea americana, murium insidiator" [tortoise-patterned (spotted) American snake, a predator that lies in wait for mice (and rats)]. The Latin adjective murinus (murina) in this case would mean "of mice" or "connected with mice," understood in context as "preying on mice", and not as "mouse-gray-colored" (another possible meaning of Latin murinus) as now often wrongly indicated for E. murinus. Early English-language sources, such as George Shaw, referred to the Boa murina as the "rat boa" and the Penny Cyclopaedia (Vol. 5) entry for boa explained: "The trivial name murina was given to it from being said to lie in wait for mice." Linnaeus described the appearance of the Boa murina in Latin as rufus maculis supra rotundatis [reddish-brown with rounded spots on upper parts] and made no reference to a gray coloration. Early descriptions of the green anaconda by different authors variously referred to the general color like brown, glaucous, green, or gray. Common names for E. murinus include green anaconda, anaconda, common anaconda, and water boa. 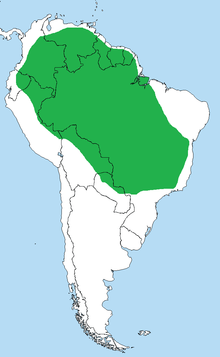 Eunectes murinus is found in South America east of the Andes, in countries including Colombia, Venezuela, the Guianas, Ecuador, Peru, Bolivia, Brazil, the island of Trinidad, and as far south as northern Paraguay. The type locality given is "America". Anacondas live in swamps, marshes, and slow-moving streams, mainly in the tropical rainforests of the Amazon and Orinoco basins. They are cumbersome on land but stealthy and sleek in the water. Their eyes and nasal openings are on top of their heads, allowing them to lie in wait for prey while remaining nearly completely submerged. The primarily nocturnal anaconda species tend to spend most of its life in or around water. Anacondas are also sometimes known as the water boa; they spend more time in the water than any of the boas. They seem rather slow and sluggish when traveling on land due to their size, although they have the potential to reach high speeds in the water. They tend to float beneath the surface of the water with their snouts above the surface. When prey passes by or stops to drink, the anaconda will strike (without eating or swallowing it) and coil around it with its body. The snake will then constrict until it has suffocated the prey. Primarily aquatic, they eat a wide variety of prey, almost anything they can manage to overpower, including fish, birds, a variety of mammals, and other reptiles. Particularly large anacondas may consume large prey such as tapirs, deer, capybaras, caimans, and even jaguars, but such large meals are not regularly consumed. The green anaconda's eyes and nose are located on the top of the head, allowing the snake to breathe and watch for prey while the vast majority of the body is hidden underwater. Many local stories and legends report the anaconda as a man-eater, but little evidence supports any such activity. They employ constriction to subdue their prey. Cannibalism among green anacondas is also known, most recorded cases involving a larger female consuming a smaller male. While the exact reason for this is not understood, scientists cite several possibilities, including the dramatic sexual dimorphism in the species, and the possibility that a female anaconda requires additional food intake after breeding to sustain the long period of gestation. The nearby male simply provides the opportunistic female a ready source of nutrition. This species is solitary until the mating season, which occurs during the rainy season, and can last for several months, usually from April to May. During this time, males must find females. Typically, female snakes will lay down a trail of pheromones for the males to follow, but it is still unclear how the males of this species track a female's scent. Another possibility is that the female releases an airborne stimulant. This theory is supported by the observation of females that remain motionless while many males move towards them from all directions. Male anacondas also frequently flick their tongues to sense chemicals that signal the presence of the female. Many males can often find the same female. Although it may not be necessary for there to be more than one male, this results in odd clusters referred to as "breeding balls", in which up to 12 males wrap around the same female and attempt to copulate. The group could stay in this position from two to four weeks. This ball acts as a slow-motion wrestling match between the males, each one fighting for the opportunity to mate with the female. During mating, males make use of their spurs to arouse the female. They aggressively press their cloacal regions hard against the female body, while continuously scratching her with their spurs. This can produce a scratching sound. Mating approaches its climax when the stimulus of the males' spurs induces the female snake to raise her cloacal region, allowing the cloacae of the two snakes to move together. The male then coils his tail, surrounding the female and they copulate. The strongest and largest male is often the victor. However, females are physically much larger and stronger and may decide to choose from among the males. Courtship and mating occur almost exclusively in water. Mating is followed by a gestation period that lasts about six to seven months. The species is ovoviviparous, with females giving birth to live young. Litters usually consist of 20 to 40 offspring, although as many as 100 may be produced. After giving birth, females may lose up to half their weight. Neonates (babies) are around 70–80 cm long and receive no parental care. Because of their small size, they often fall prey to other animals. Should they survive, they grow rapidly until they reach sexual maturity in their first few years, after which their rate of growth continues at a slower pace. However, when no male anacondas are available to provide offspring facultative parthenogenesis is possible. In August 2014 West Midlands Safari Park announced that on 12 August 2014 a female Green anaconda, which was being kept with another female anaconda, through parthenogenesis had given birth to three young. One may reasonably maintain an average and acceptable temperature for the snake by the use of a heating element or infrared light bulbs. A gradient must be offered within the enclosure to allow the snake to bask in the heat or go to cooler areas in the tank. Optimum humidity can be difficult to maintain and research must be done on the snake to determine the correct level. More than 80% humidity must be maintained for caging an anaconda species from the tropical region, while a slightly less than 30% humidity must be maintained for a species of a desert region. Photoperiods are often used with most species of snake; natural light is best for this, but low UV percentage bulbs can also be used. Captive anacondas have a reputation for unpredictability and aggression due to the temperaments of wild-caught specimens first collected for captive breeding, but with proper care, green anacondas can and do make for calm, relatively sedate pets. Due to their immense size and power, however, proper respect and caution should always be maintained, and they are best left to experienced adult owners who can provide them with the proper requirements. 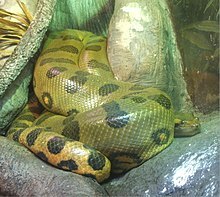 Anacondas have been portrayed in horror literature and film, often with the ability to swallow adult humans; these traits are occasionally also attributed to other species, such as the Burmese python and the boa constrictor (though the latter does not grow to a large enough size to kill and swallow a human). Among the most popular such films is the 1997 film, Anaconda, and its three sequels. This species is also the main antagonist in Mathias Bradley's novel, Anacondas: The Terror of the Amazon Rainforest, in which multiple hybrid anacondas escape from a research facility in the Amazon Rainforest and come into contact with a toxic chemical that causes them to rapidly mutate into gigantic snakes. A more positive depiction of the anaconda exists in the short stories Anaconda and El Regreso de Anaconda ("The Return of Anaconda") by Horacio Quiroga, which are told from the anaconda's point of view. ^ a b c d e f Rivas, Jesús Antonio (2000). The life history of the green anaconda (Eunectes murinus), with emphasis on its reproductive Biology (PDF) (Ph.D. thesis). University of Tennessee. ^ O'Shea, M. 2007. Boas and pythons of the world. Princeton, N.J.: Princeton University Press. ^ Minton, Sherman A., and Madge Rutherford Minton. Giant Reptiles. New York: Scribners, 1973. ^ Rivas, J., G. Burghardt. 2001. Understanding Sexual Size Dimorphism in Snakes: wearing the snake's shoes. Animal Behaviour, 62: F1-F6. ^ Pope, Clifford Millhouse. The Giant Snakes: The Natural History of the Boa Constrictor, the Anaconda, and the Largest Pythons, Including Comparative Facts about Other Snakes and Basic Information on Reptiles in General. New York: Knopf, 1961. ^ Duellman, W. 2005. Cusco Amazonico: The Lives of Amphibians and Reptiles in an Amazonian Rainforest. Ithaca, New York: Comstock Books in Herpetology. ^ a b c d e f g h i j k Wood, Gerald (1983). The Guinness Book of Animal Facts and Feats. ISBN 978-0-85112-235-9. ^ a b c d Murphy JC, Henderson RW. 1997. Tales of Giant Snakes: A Historical Natural History of Anacondas and Pythons. Krieger Pub. Co. 221 pp. ISBN 0-89464-995-7. ^ Rivas, Jesús A.; Rafael E. Ascanio & Maria D. C. Muñoz (2008). "What is the length of a snake?" (PDF). Contemporary Herpetology. 2008 (2): 1–3. Archived from the original (PDF) on July 25, 2011. ^ Pritchard, P. C. (1994). "Letters to the editor". Bulletin of the Chicago Herpetological Society. 29 (12). ^ Linné, Carl von (1758). Systema naturae per regna tria naturae. 1 (10th ed.). p. 215 – via Biodiversity Heritage Library. ^ Shaw, G. 1802. General Zoology, or Systematic Natural History Vol. III [(Part II) Amphibia (Order Serpentes): pgs. 351--352]. Thomas Davison, London. 615 pp. ^ Wagler, J. 1830. Natürliches System der Amphibien, mit Vorangehander Classification der Säugtiere und Vögel. J. G. Cotta'schen Buchhandlung, München. 354 pp. ^ Seba, A. 1735. Locupletissimi rerum naturalium thesauri accurata descriptio. Vol. 2. (pg 30). J. Wetstenium, & Guil. Smith, & Janssonio-Waesbergios, Amsterdam. ^ Linnaeus, C. 1758. Systema Naturae. 10th ed., Vol. 1 (pg. 215). Laurentii Salvii, Stockholm, 824 pp. ^ ""Pescaron" una anaconda de siete metros y 90 kilos" [Seven-meter-long, 90 kg anaconda "fished"] (in Spanish). ABC Color. 4 January 2008. ^ "Green Anaconda Eunectes murinus". National Geographic. Retrieved March 14, 2011. ^ a b Soomro, Adil (2001). "Eunectes murinus". University of Michigan Museum of Zoology. Animal Diversity Web. Retrieved 2008-10-10. ^ Eunectes murinus (Green Anaconda): Cannibalism Archived 2010-03-01 at the Wayback Machine at Prodigy Archived 2010-03-13 at the Wayback Machine. Accessed 3 July 2008. ^ Burton, Maurice, and Robert Burton. International Wildlife Encyclopedia, pg. 44. ^ "BBC News - Female anaconda's West Midlands Safari Park 'virgin birth'". BBC News. ^ "Miraculous Birth at West Midland Safari Park". wmsp.co.uk. Archived from the original on 2014-08-31. ^ Fowler, Murray E.; Zalmir S. Cubas (2001). Biology, Medicine, and Surgery of South American Wild Animals. Blackwell Publishing. pp. 40–41. ISBN 0-8138-2846-5. Dirksen L, Böhme W. 1998. Studien an Anakondas 2: Zum taxonomischen Status von Eunectes murinus gigas (Latreille, 1801) (Serpentes: Boidae), mit neuen Ergebnissen zur Gattung Eunectes Wagler, 1830.- Salamandra 34(4): 359-374. Dirksen L. 2002. Anakondas. Monographische Revision der Gattung Eunectes (Wagler, 1830).- Natur und Tier-Verlag Münster. ISBN 3-931587-43-6. 187 pp. Rivas, J. A., M. d. C. Muñoz, J. B. Thorbjarnarson, G. M. Burghardt, W. Holmstrom, and P. Calle. 2007. Natural History of the green anacondas in the Venezuelan llanos. Pages 128-138 in R. W. Henderson, and R. Powell, editors. Biology of Boas, Pythons, and Related Taxa. Eagle Mountain Publishing Company, Eagle Mountain. Wikimedia Commons has media related to Eunectes murinus. Anacondas.org. Accessed 30 April 2012. Giant Anaconda - Hunting. National Geographic - Check123. This page was last edited on 16 April 2019, at 06:24 (UTC).